Why Does My Puppy Cry in His Sleep? Is Beau in pain or is he having a nightmare? I know from experience that it’s scary to observe a sleeping animal which suddenly starts twitching. 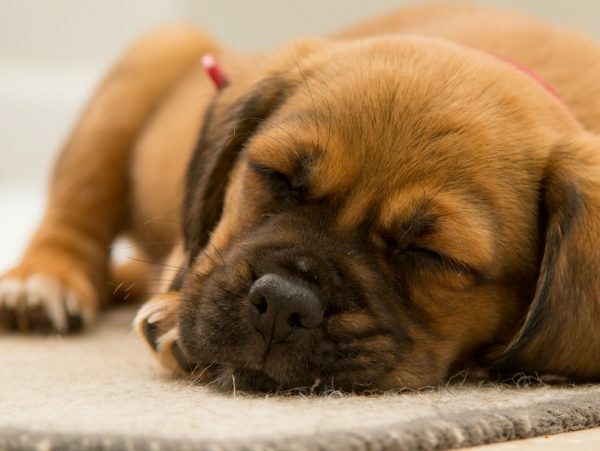 So, today we’re going to talk about why your puppy whimpers and twitches in his sleep. Should you wake up your dog? First, allow me to calm you down. There’s nothing wrong with your puppy. In fact, it’s normal for puppies and kittens to cry in their sleep or twitch and jerk. Your puppy might even bark or howl at some point. It doesn’t mean that he is in distress or pain, so you shouldn’t be speed dialing your vet. The explanation is a simple one, and it’s right in front of your eyes. Your puppy is just dreaming. In the past, dreaming was something science thought only humans could do. But scientists now know that animals are also capable of dreaming, although they can’t say for sure whether they dream in the same way we do. Humans dream when they enter the REM phase of the sleep cycle. That’s when your eyes start to move rapidly beneath the eyelids. Scientists have observed the same thing in sleeping animals, which suggests that they do enter the dream realm. 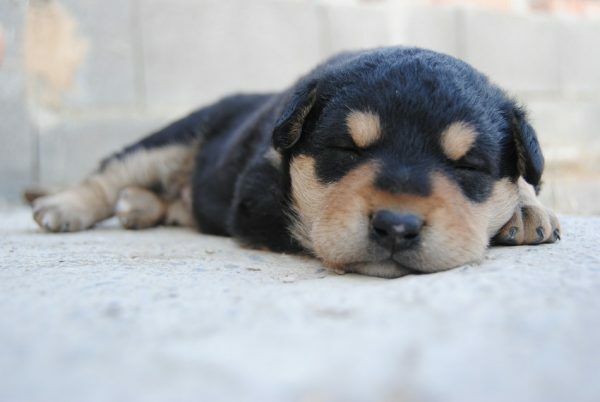 Researchers have also compared the brain waves of sleeping dogs to the brain waves of humans. They found them to be similar so they conclude that dogs might dream similarly to us. RELATED: What is a Water Puppy? The slow-wave phase is what we call “dozing off.” The dog starts to fall asleep, his breathing gets deeper, and the heartbeat slows down. After 10-20 minutes, depending on the breed, the puppy enters the REM phase and starts dreaming. Once the puppy enters the dream phase, you’ll notice that his breathing is shallow and irregular and that his eyes are moving rapidly under the eyelids. That’s because he is looking at dreamy objects and events as if they’re real. The same thing happens to you during your REM cycle. However, our sleep cycle is around 90 minutes, while the dog one is about 30-45 minutes. Depending on the size, dogs spend around 1-5 minutes in dreams. Doesn’t seem much, right? You should also know that when animals and humans sleep their body gets paralyzed. The reason is quite simple – it prevents you from enacting whatever you’re dreaming about. However, sometimes the paralysis is not complete. That’s why we see puppies jerk while sleeping or move their paws as if they’re running. As you know, researchers state that when we dream our brains sort through the events of the day and process everything that has happened. That’s why we sometimes relieve traumatic or exciting moments in our sleep. Well, the same thing happens to our puppies! Stanley Coren, a dog behaviorist, explains that dogs probably dream about their daily activities. When you see Beau kicking with his legs, he might be recalling chasing after a rabbit or cat. If he is whimpering, he might be remembering you scolding him for something. Since you didn’t know all that you’ve probably panic the moment you’ve thought something is wrong with your pet, right? As a result, you might have tried to wake up the poor fellow. Well, that’s something you shouldn’t do. Let me explain why. First, you’re interrupting your dog’s natural sleep cycle. You’re preventing your pooch from getting the rest he needs. 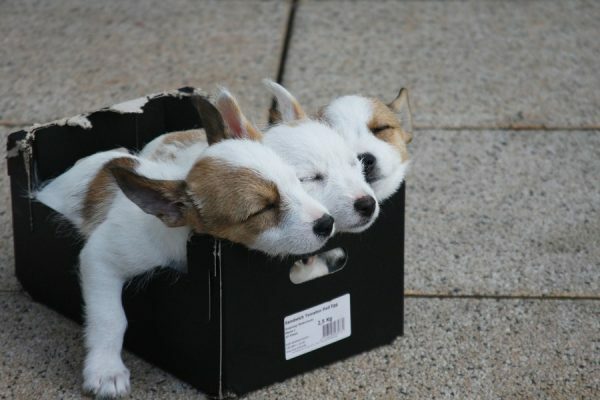 Puppies, for example, need all the sleep they can get because their bodies are working hard. It’s not an easy job growing up. Second, you will startle the puppy badly. Imagine how you’d feel if someone wakes you up suddenly. Out of your mind with panic, probably. Well, Beau feels the same and might unintentionally bite or snap at you. If you think that your dog has a nightmare and you want to wake Beau up, call his name across the room. You might also make a loud noise to snap him out of the dream. But don’t touch him! However, puppies and dogs rarely have such terrifying dreams as we do. The chances that Beau is having a nightmare are very slim, so just let him sleep. The bottom line is that a puppy crying in his sleep is not a reason for panic. However, if the puppy sleepwalks, he might have a rare sleeping disorder. In this case, consult with your vet as soon as possible. What do you think on the matter? 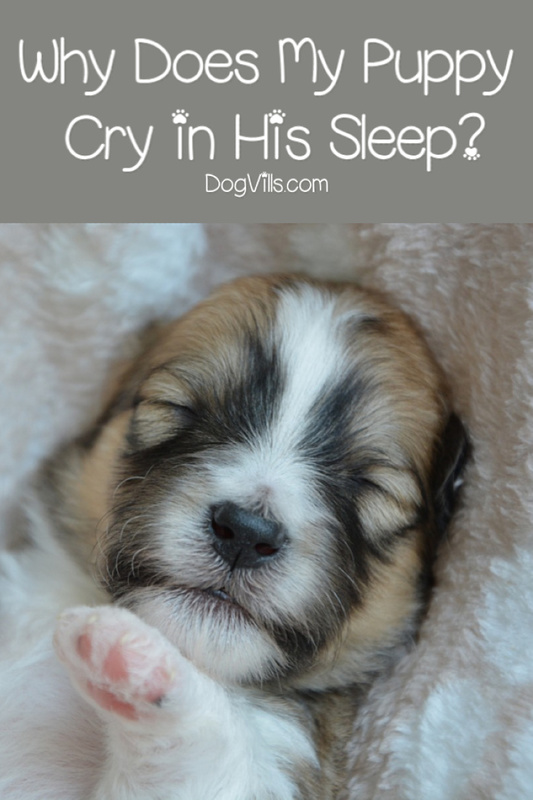 Why does your puppy cry in his sleep? Share your thoughts in the comment section.